Did you know there is a national memorial near the Thomas Jefferson Memorial dedicated to George Mason, one of America’s Founding Fathers? If you aren’t familiar with George Mason, you are not alone. He is one of the oft-forgotten historic figures and, on some of the tours I’ve been on, it has been suggested this was because he was steadfast in his beliefs and did not go along with some of the other Founding Fathers. Especially when it came time to sign the U.S. Constitution. Even though history perhaps hasn’t always recognized his contributions very prominently, they are of importance. Mason penned the Virginia Declaration of Rights which had inspired Thomas Jefferson as he was writing the Declaration of Independence. Mason’s writings also served as a model for the U.S. Bill of Rights, French Declaration of the Rights of Man and Citizen and the U.N.’s Universal Declaration of Human Rights. Mason’s memorial is not like some of the other memorials which are grand structures but has a more subtle design. 2. The memorial to George Mason to an established garden called the “Pansy Garden”. Today the memorial contains a statue of a relaxed Mason sitting on a bench underneath a trellis. 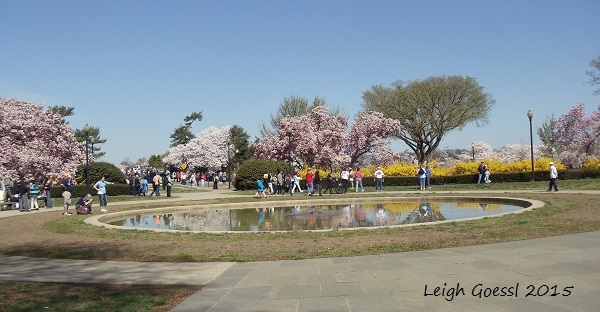 In front of the memorial is a pool with a fountain and the memorial is surrounded with beautiful flowers and splendid magnolia trees and contrast nicely with the forsythia bushes. 3. Faye B. Harwell was the architect of the Mason Memorial. The memorial was authorized in 1990 but groundbreaking didn’t take place until 2000. 4. 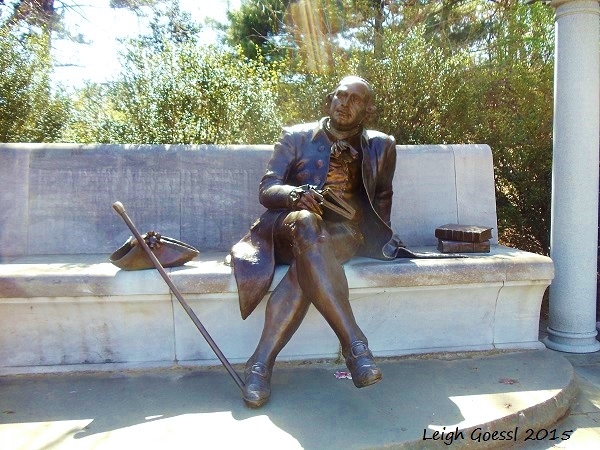 The bronze sculpture of Mason was made by Wendy Ross. Mason’s likeness possesses two bronze books on one side with his hat and walking stick on the other. 5. The trellis is 72 feet long and 9 feet tall. 6. There are three walls underneath the trellis which are inscribed with some of Mason’s wisdom. If not for Mason, there wouldn’t be a Bill of Rights as he would not sign the U.S. Constitution because it did gave too much power to the federal government. These walls are 4 feet tall. 7. Kevin Roustazad carved the inscriptions of Mason’s words. 8. 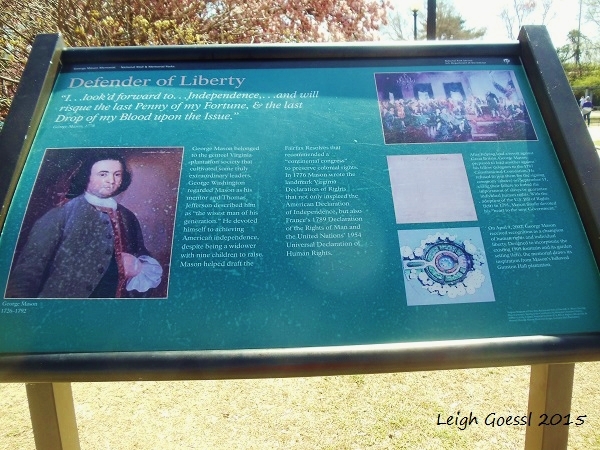 A plaque stands at the front of the memorial and is titled, “Defender of Liberty” and gives some history about this man. 9. The original pansy garden is said to have been constructed in the late 19th century and was a Victorian garden. It was later redesigned as the Pansy Garden in 1929. 10. The memorial is located near the intersection of Ohio Drive and East Basin Drive, SW. It is open 24 hours a day. Additionally, George Mason’s home has been preserved for the public to visit and learn more about his life and property. It is located about 30 miles south of the District. You can learn more about visiting Mason’s home on an earlier post I wrote. I invite you to visit this post if you want to learn more about him or see photos of the property. I happened to see this on G+ so I came to read. 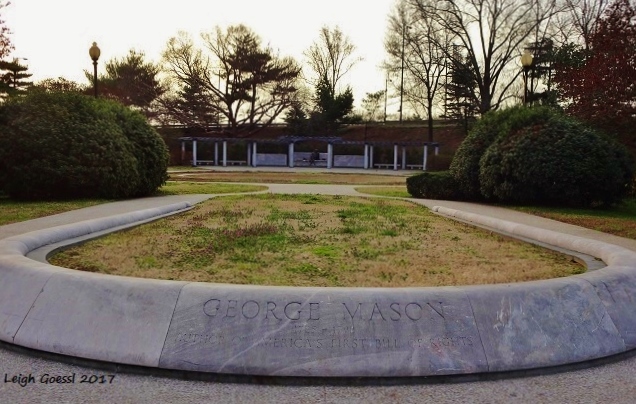 I spent a LOT of time walking around in the DC area in the 90s but never saw the George Mason Memorial. I learned something new by reading this. The garden apparently was in existence in the 1990s but the statue and other features would have been added later. I didn't know about it for a few years after living here, it's sort of tucked to the side, easy to miss. Okay. I wondered how I could have missed it especially if it was actually on tourist maps.